They're most closely associated with weddings, but dyeable shoes can be a godsend for any occasion when you desperately need a pair of shoes in a hard to find color. Proms, parties--even work and casual occasions when you've bought a great outfit but just can't find the shoes to match. As the name suggests, dyeable shoes are made from material which can easily be dyed to suit your requirements. 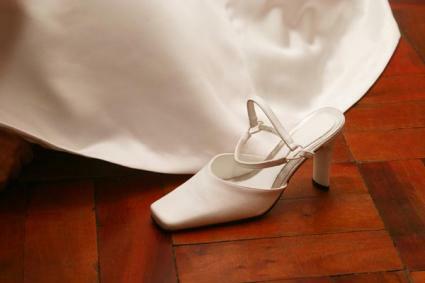 They're most often used by brides to be, who need to find a shoe that's an exact-match for their dresses, or who need their bridesmaids to wear different styles of shoe in the same color. 1. Pre-Dyed Shoes By purchasing your shoes from a retailer specializing in dyeable shoes, and having them dye the shoes for you, you can rest assured that your shoes will be dyed professionally. If you're unhappy with the outcome, you'll have some recourse with the seller. At retailers such as Peter Fox, you simply mail in a swatch of fabric from the dress or other garment you'd like your shoes to match, and the company will mix the color and dye the shoes for you. This is by far the best option when dyeing shoes, as very unusual colors can be catered to, and you can be sure of a professional job. 2. Use a Professional Dyeing Service Your next best option is to purchase a pair of dyeable shoes yourself and then use a professional dyeing service such as the one offered at Bobbi Specialty Shoe Dye who will not only dye your shoes for you, but also other accessories such as hats, bags and belts. Again, by using a professional dyeing service, you know that your shoes won't be wasted by a bad dyeing job! 3. DIY Dye There are a number of shoe dyeing kits on the market, such as this product from TRG, which allow you to dye your shoes yourself. While many of the dyes available to use in this fashion are similar to the dyes used by the professionals, you should remember that the professionals have been trained in how to use them, and you haven't! Shoe dyeing is something that can very easily go wrong, and you really don't want to make an irreversible mistake with your precious wedding or prom shoes. If you do want to give it a try yourself, it's a good idea to have a practice run (or two!) first, using an old or cheap pair of shoes that you don't mind wasting. Can Any Shoes Be Dyed? No, is the short answer. The best types of shoes to dye are those with fabric or satin uppers, which will most easily absorb the color. Leather and suede can also be dyed, but this is a trickier process, and one which is perhaps best left to the professionals! If you're in any doubt at all as to whether a particular pair of shoes can be dyed, ask the retailer. To avoid any doubt, try buying your shoes from a dyeable shoes specialist, and have them take care of the dyeing for you. Yes, it will cost you more, but not as much as the cost of a whole new pair of shoes!